Ask anyone who has visited Brosy Family Dentistry in Reno about their experience and you’ll discover that the words “warm,” “inviting” and “relaxing” come up a lot. That can’t be said of many dentist’s offices. For some, a trip to the dentist involves anxiety and a sense of dread. Not at Brosy. 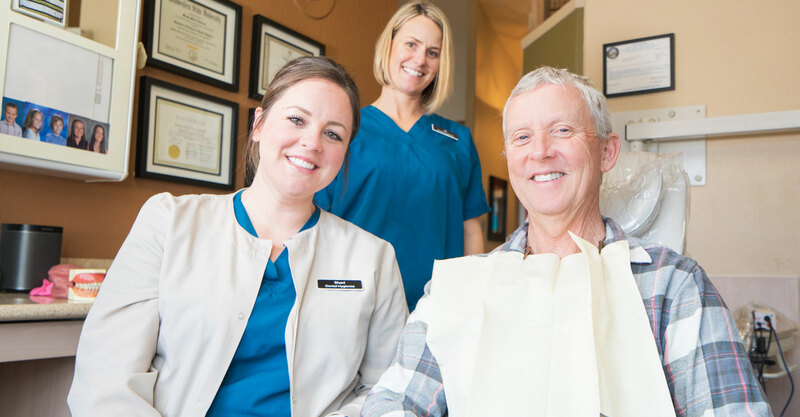 At our Reno dental practice, we are proud of the fact that our patients range in age from 1 to 100, which means everyone is welcome, from the young to the young at heart. We tailor treatments based on the patient’s age, comfort level and their experience with dentistry. For the younger patients, we offer interactive play (brushing a stuffed dinosaur’s teeth, anyone?) to fitting you and your significant other in at the same time. Whatever makes your experience a good one, we’re here to help. Over the years, we’ve built a practice with patients who have been with us since the beginning. We consider it an honor that they’ve trusted their children and grandchildren’s dental health to us. Watching our young patients grow into healthy, smiling adults may be the greatest testament of all to our work. Learn about the Brosy Experience including office amenities and see why so many patients keep coming back for a comfortable, stress-free visit year after year. From the moment you call to book an appointment to the day of your visit, our staff treats you like a member of the Brosy family. That’s intentional. Why? Because we understand a trip to the dentist isn’t exactly a walk in the park for many folks. We aim to make your visit a memorable and comfortable one, regardless of why you’re visiting us. Dentistry has seen many technological advancements, but the one thing that hasn’t changed is the philosophy of treating each patient as an individual and developing a course of treatment suited to them. You might visit Brosy for a routine cleaning or a more in-depth procedure such as a root canal or fillings (links to procedures). Regardless, we believe everyone should walk away satisfied, happy and healthy. When you walk into our Reno dentistry office, you’re greeted by friendly, professional staff intent on making your visit a positive one. Once a week, we offer hand massages from Dedee Lock, massage therapist, either before or during your appointment. We believe this contributes to reduced stress and lower blood pressure as well as an overall better dental experience. And our patients agree. The experience of a relaxed environment is critical not only to dental health, but overall health and well-being. During your appointment with Dr. Anderson, we also offer headrest pillows because we know the dentist’s chair isn’t exactly the most comfortable place for many people to be. We also offer headphones and soothing music for those who would rather tune out the world during treatment. Brosy Family Dentistry wants you to enjoy your time at our office. By providing these amenities, we’re telling you we value your time and your business. And we hope you’ll become a lifelong patient who spreads the good word to your friends and family, as well.